GrooveQuest will transform your special party into an unforgetable groovalicious event! of the season begin today! A Duo (Steve & Lisa) Gig! GQ continues to develop Maryland venues and we're thrilled to partner with Crossroads BBQ! It's the former O'Brien's Pit BBQ and the former Branded 72. The kitchen is open late, and the menu has been expanded, offering meat and plant-based options! You'll love the new Crossroads! It's freeway close and there's tons of free parking. As always, bring your dancin' shoes! JW and Friends has a new owner/manager! You'll love the changes and will want to be part of the continuing groovi-licious tradition there. As always, bring your dancin' shoes! GrooveQuest is thrilled to celebrate Labor Day with the fine folks at Knollwood. Happy Anniversary, Karl and Ana!! GQ is proud to play for those who have served! Lisa's birthday starts at midnight!! 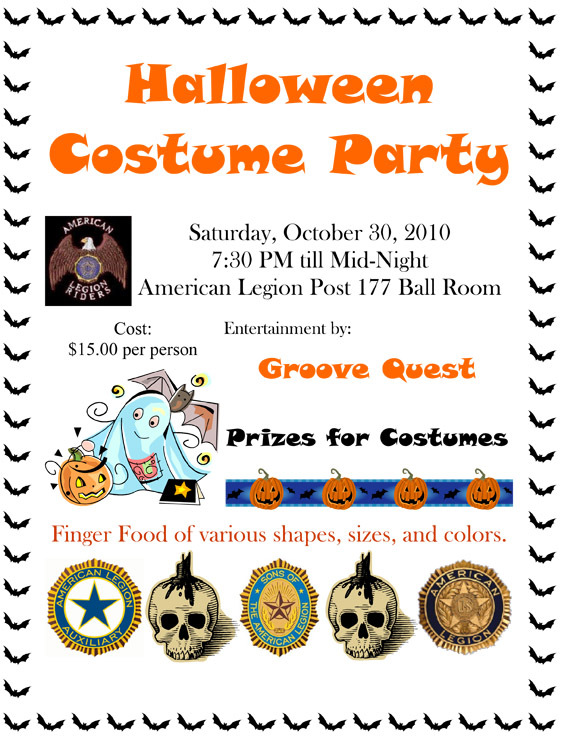 GrooveQuest is looking forward to this fun dance party for the Baby Boomer Club! S & A has been Lisa's day gig for several years. An arduous relocation was recently completed and everyone's celebrating the grand re-opening. You won't believe your eyes *or* ears! Our first gig of the year...at Good Ol' Clyde's! Check GQ's availability for Your party! Find something Special in Your Stocking!!
! !==>> in the Crew Bar <<==!! Did you know endorphines might aid digestion and burn calories? There's no better place to extend your Thanksgiving "Feel Good" than Clyde's! "Annapolis" - - click link! In the Wharf Bar..."in the back"
We're back from our little "Va-Ca." Don't Miss It! - See You There!! We Love crossing the Potomac, but maybe you'd prefer to stay in GrooveQuest's (and your) backyard. There's no better room in Maryland than the Race Bar. Join us for a good ol' Great Time! In the back bar, not the Crew Bar!! St. Patrick's Day falls on a Friday so seldom! Eat, drink, dance, and be GROOVY! Come to JW & Friends and do it right! 2017 - Get Ready for It! and Start it out Right at Clyde's with GrooveQuest! We dig being dug! Wayne is having us back...thank *you* so much for coming out and enjoying our music! Lots of room on the wooden dance floor! Last Saturdays at Clyde's continue! Be Merry and Bright! May all of your holidays be Groovy! Join us at this special time of year. Eat, drink, dance, and be groovy! Thank you (so much!) to our fans who recommended us to Wayne at JW & Friends. We’re thrilled to bring our uplifting vibe and danceable grooves to you at JW & Friends. Check 'em out at the link above. GrooveQuest is thrilled to celebrate the anniversary of U.S. independence with those who have defended and preserved it. and enjoy our "space race" -era music. GrooveQuest's "Last Saturday" Gigs Continue in 2016!! Thanks to Clyde's and Y'All! Start it out Right at Clydes with GrooveQuest! Make your event and EVENT!! Famed DC Chef Robert Wiedmaier manifests his passion for rock 'n' roll at this hip Bethesda club. The music and food are simultaneously bold and comfortable. Check out the V&S website here. We'll be "Playing the Wall." ...which means we'll play music from each of the seminal rockers whose portraits are on the wall by the stage. This is GrooveQuest's debut at V&S, and it'll be so great to have you there! GrooveQuest is thrilled to be part of the cozy and delicious scene at Sligo Café. Spend your Sunday evening here with us, and your whole week will be happy and balanced. It’s not just a gig, but a scene and vibe that’s good for our community. Weather permitting, GQ will be outside on the patio. Don’t miss out on this good time. Markham's is the place to be!...Great Vibe; Great American food. Visit their website HERE. Double the Endorphins - See You There!! Bring Your Valentine to Clydes! Feel the Love - See You There!! Hello Maryland!! It's always a party at Markham's!......the new, cool place in Bethesda; Great American food. Visit their website HERE. It's always a Groovy time at Clydes! Markham's is having us back, and we're jazzed...and Grooved! Thrilled that it's easy for our Maryland friends to have a good time with us. Markham's is the new gem on Wisconsin Avenue. They serve great American food. Visit their website HERE. & Every "Last Saturday" in 2014! Now catch us in Maryland! Markham's is the new, cool place in Bethesda; a gem on Wisconsin Avenue. Great American food. Visit their website HERE. 1st Time in Chevy Chase!! A Groovelicious Happy Hour on the outdoor patio. Happy hour prices are from 4 to 7. Music from 5 to 9. It's the GrooveQuest Trio doin' it! We're having a blast at Clyde's. What a delicious, fun place. Be There!! Wow! Thanks for making Clyde's so much fun; they're having us back. Don't let the summer end without one last blast with the original Spirit of Rock 'n' Roll. This is an exciting debut for GrooveQuest. Clyde's is famous for their great food, drink, live entertainment, and over-the-top service. We celebrate the good times it offers and hope you'll join us. The easiest way to give meaningful gifts this holiday season. Live music by the GrooveQuest Duo and 3 other musical acts throughout the event. This is our innaugural gig at a restaurant and club in Maryland you may already know and love. This community event has been organized by local residents who are interested in promoting environmental awareness and the development of a sustainable economy in Carroll County. Admission is Free; see link above for directions and for making a donation. There will be activities for all ages: information booths and workshops showcasing a wealth of information, delicious food with options for all types of diets, a farmers' market stocked with local plants and veggies, live music and a kids area! The Alternative Gift Fair will take place at Takoma Park Presbyterian Church at the corner of Maple & Tulip, 2 blocks from the Takoma Metro Station on the red line.Bypass the annual stress of holiday shopping while honoring friends and relatives and supporting life-giving projects in our local and global communities. At the Takoma Park Alternative Gift Fair, you can shop from a diverse collection of local, national and international organizations with established track records of helping people and the environment. Gift-giving opportunities range from donations to local and national organizations, to items specifically targeted to people in need: clean water to someone in Burundi, livestock to a Croatian family, safe inoculations to someone from Haiti, and much more. The Alternative Gift Fair will take place at Takoma Park Presbyterian Church at the corner of Maple & Tulip, 2 blocks from the Takoma Metro Station on the red line. Bypass the annual stress of holiday shopping while honoring friends and relatives and supporting life-giving projects in our local and global communities. At the Takoma Park Alternative Gift Fair, you can shop from a diverse collection of local, national and international organizations with established track records of helping people and the environment. Gift-giving opportunities range from donations to local and national organizations, to items specifically targeted to people in need: clean water to someone in Burundi, livestock to a Croatian family, safe inoculations to someone from Haiti, and much more. The fair will include green building materials and methodologies, renewable energy technologies, sustainable agriculture and local agriculture products, and sustainable living practices that aim to forge a healthier relationship with the natural world and its resources. Additionally, speakers will conduct breakout group sessions for various topics. This fair will be a near zero waste event. Holidays are coming! Have GrooveQuest make your gathering memorable and special. Lisa and Joel play with "Dave Johnson and Friends"
Please - no pets allowed! This fair will be a near zero waste event. The fair will include green building materials and methodologies, renewable energy technologies, sustainable agriculture and local agriculture products, and sustainable living practices that aim to forge a healthier relationship with the natural world and its resources. Additionally, speakers will conduct breakout group sessions for various topics. An Elvis-centric fundraising event; GrooveQuest will open the evening's performances in the "Vegas Lounge" room, performing its all-new Elvis overture; "Elvature II." Night of 100 Evises always sells out. A new venue for GrooveQuest! The Quarry House has been funky forever. Rediscover this Silver Spring landmark and groove the night away. Free parking available at Farm Women's Coop next door. Be a part of the always-emerging, always cool, always hot scene in Bethesda. It's Friday! Forget cooking...chill out with some hot music and Thai food. Full menu is available 'til closing. Acme Blues Co. follows GQ, so bring your dancin' shoes and ears early and enjoy your Friday the Groovaliscious way. Join us for a Rock 'n' Roll Weekend! GrooveQuest plays from 7:30pm to 9:30pm. Camp overnite and tube down the Potomac on Sunday. Beautiful get-a-way; only 90 minutes from DC. Rock 'n' Roll Weekend (see above) mellows out with The GrooveQuest Trio providing music-to-taste-wine-by. Great wines served in a gorgous setting. Another beautiful get-a-way; only 90 minutes from DC. 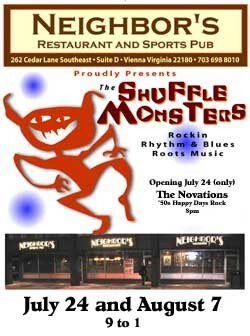 Vegas is a new live music venue in Bethesda's hot restaurant district. Tonight, you're not just Groovin' with GQ; you're sayin' "YES" to Live Music. A Win-Win sitch you won't want to miss. An Elvis-centric fundraising event; GrooveQuest will open the evening's performances in the "Vegas Lounge" room, performing its Elvis overture; its "Elvature." Celebrate St. Patrick's Day whilst enjoying the cool, friendly vibe of Mark's Pub, and the groovaliciousness of GrooveQuest. Forget cooking...chill out with some hot music and Thai food. Full menu is available 'til closing. The GrooveQuest Project (Steve, Lisa, and Al) reinterprets and recreates GrooveQuest's trademark brand of exhuberance. GrooveQuest's groove team (Shufflemonster and Groovestress) and spiritual advisor (Jano Schiff) are performing with the Sookie Jump band at this Elvis-centric fundraising event. Have GrooveQuest make *your* party a big success! Fajitas night too! Don't miss it. See link above for full details, directions, and tickets. We're hot off the Night of 100 Elvises event -- inspired by all we saw, heard, and did. Discover or rediscover the joy in this great music. Didn't make it to Night of 100 Elvises? Catch GrooveQuest's all-new Elvis Show, debuting at Neighbor's this night. Elvis possessed "exuberant karmic abundandce" in spades, and GrooveQuest gladly pays tribute. Don't miss this show. BIG ELVIS BIRTHDAY SHOW ! (70TH Anniversay). PLEASE NOTE: Jay's Saloon is the new location of this event. Were you "there" in '54 to '67? Whether or not, come to Neighbor's and experience the excitement and optimism of the era -- real-time! Great food and a fun time await! Enjoy "Elvis," friendly service, a pick-me-up vibe and more! Steve, Lisa, and Shufflemonster co-host an open mike/jam with guitar superstar Bob Hume. The year's biggest gathering of an incredibly fun group of home-brewing hobbyists. Neighbors is spacious and comfortable; an island of tranquility! Come get a drink for a reasonable price; no cover, no minimum. Great food, great prices, easy parking, and exuberant karmic abundance.
. **Special Event: GrooveQuest very own Shufflemonster in a (nonconflictual) engagement with Sookie Jump at the Zoo Bar. Weekend for Hepatits C Awareness, National March on DC. This is the concluding segment of this important weekend event. It takes place at the base of the Lincoln Memorial. GrooveQuest is playing a set and providing sound services. The headliner is Timothea, New Orleans' "Siren of Soul" and The Blue Soul All-Star Band. Please visit this site for more info. Join us at this great venue. Your endorphines will thank you for it. Come stock up on Exubert Karmic Abundance! Hire GrooveQuest for your event! Come join us at our home base for exuberant karmic abundance. Celebrate your birthday, anniversary, or any special event with us at Neighbor's. Neighbor's is the most user-friendly live music venue around. GrooveQuest is on vacation . . .
WAMMIE Award Winner MELANIE MASON will perform selections from her new CD. Don't miss this special solo, acoustic performance. 9 to 10. 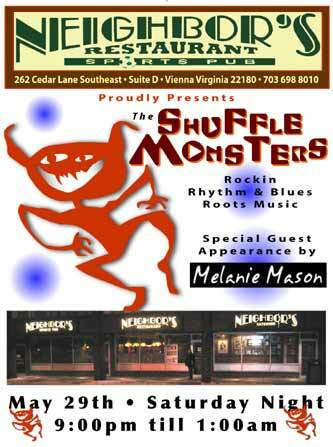 Then, Shufflemonster and Friends [Sookie Jump from Zoo Bar fame] will take the stage 10 to 1. R&B to the max. Jammin' on Saint Paddy's Day . . . a certain birthday, too. Bring yer axe. Take a "tour" and get directions to Neighbor's here. Steve, Lisa, and Shufflemonster play with host Bob Hume; an exceptional jam; bring yer axe. Steve, Lisa, and Lowell join Bob Hume's house band for open mic at JV. We'll do 6 tunes 'n' turn it over to you or your musician friends; bring yer axe. You know, Steve, Lisa, and Lowell join Bob Hume for the the great JV open jam. Bring yer axe. "TC Lite" joins Bob Hume's house band for open mic at JV. We'll do 6 tunes 'n' turn it over to you or your musician friends; bring yer axe. This Saturday, December 6th, Takoma Crossing will be entertaining enlightened shoppers at the annual Takoma Park Alternative Gift Fair. Takoma Crossing "Lite" performs from 2 to 3. Hope to see you there! Once again: "TC Lite" joins Bob Hume's house band for open mic at JV. We'll do 6 tunes 'n' turn it over to you or your musician friends; bring yer axe. TC joins Bob Hume's house band for open mic at JV. Yep, tonight, Takoma Crossing, in its entirety, will be at JV's; rockin' out 'n' feeling good. The 3-day outdoor celebration of the homebrewing hobby held each summer. Open to all homebrewers, their families and friends, regardless of club affiliation. Cowboy Cafe South continually celebrates the down-home spirit and soul of Columbia Pike. Come on out and be part of the vibe! In the Colesville Shopping Center at the corner of New Hampshire Ave. & Randolph Rd. Bangkok Blues is a venue that embodies and exudes spirited Americana roots music; owned by a musician dedicated to, supportive of, and inspirational to musicians and patrons alike; offering totally gourmet Thai Cuisine! Good Ol' Allegro. Seeya There! Allegro is a hip, new space with a great kitchen, bar, and "hang". Come on out and have a hoppin' time whilst you support Allegro, real live music, and TC! An outdoor performance in front of WVSA at 16th and L.
32nd Annual Montpelier Spring Festival * Four stages of music, dance, children's programs, food, crafts, animals, vehicles, displays, art, animal characters * Montpelier Mansion Grounds * Noon - 6pm * For more info call, 301-776-2805.